As an example of this, the reduction of the amount of professional teams in Wales affected the performance of the national team. When the Wales provinces reduced from 9 to 5 then 4 the Welsh test team benefited. A quick look at the Welsh test results will see a sharp increase in performance post the reduction. The state of each nations club system and most importantly the stability of the clubs will impact the performance of their respective nations test teams in the coming 6 Nations and then this is further exaggerated by the 6 Nations Draw. Get a good Draw and it will potentially mask some of the inherent issues, have a bad Draw and get exposed in the worst possible way. I will look at potential signals of success or failure and the impact of the Draw for the coming 6 Nations tournament. There is no doubt that the Draw influence performance. The table below shows Tries Allowed for each 6 Nations team since 2008*. It shows the amount of Tries against for each team when they were either the Home Team or the Away Team across all games. Interestingly the outlier in the above results is England’s defensive ability away is better than at home. Playing at home is nearly always going to be better than away but what is not understood is when a game is played can have as much influence on the overall results. England are by their nature a big system team, in other words lots of talent and resources. Because of this they take longer to put together a good team. England’s starting team can perform wonders but as we saw by the first half display against Japan at the end of 2018 and some of last year’s 6 nations, when the non starting teams are brought in, they struggle to perform. Having known Eddie Jones and been coached by him for 7 years I can tell you that very little bothers him and he loves to divert the agenda. The Jack Nowell issue is a classic and whilst he may use Nowell in some plays as a first over the ball defender or on the scrum to have a flanker defend wide. It’s not a permanent thing just a thought bubble. He once had the 130kg Wallaby Prop Rodney Blake as 2nd receiver in the backs off short lineouts (and it worked ok). For England to remain healthy their starting XV will need to remain healthy. have only lost 2 Rd 1 games 2004. •	France (London) This works well for England – see below for France. •	Wales (Cardiff) You don’t want to play Wales at home, it gets adversarial. Part of the reason for the schizophrenic nature of French Rugby has been the very high level of trading and mass importation of international players into the Top 14. As an example, of the 39 players contracted to Lyon 34 of them came from other clubs. The instability on the club system makes it very difficult to understand who is playing well and who isn’t making selection hit and miss. The nature of the makeup means they should improve over the tournament as it progresses (think 2011 RWC loosing to Tonga and making the final), but my overwhelming feeling is that if Bastareaud is in the team French rugby is not in a good way. France are Slow starters Here is their Rd 1 games since 2013. •	Wales (Paris) As the French start slow this is not ideal. Home advantage but strong team. •	England (London) Being away from home and slow starters isn’t good but to get England early is much better than later. •	Scotland (Paris) Improving France at home have a good shot at this also hoping Scotland having to make changes. •	Ireland (Dublin) France want Ireland late in the tournament but in Dublin is the hard part. •	Italy (Rome) France’s perfect time and place to play Italy. Ireland are a defensive unit that is currently the most cohesive team in the world. Since 2013 France have played 480 minutes of Rugby in Dublin only scoring 2 tries. Ireland are only allowing 12 points per game over the last few years. 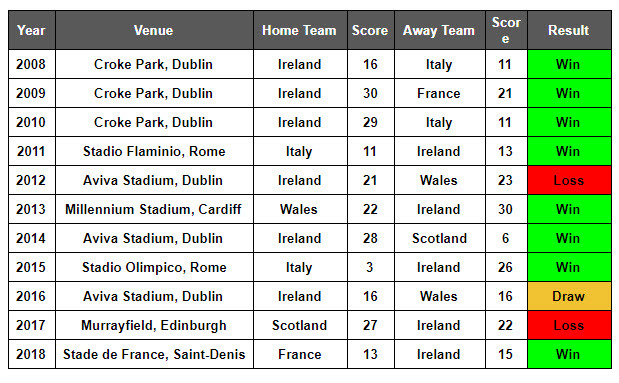 Ireland generally start well, below is their Rd 1 record. They are however a different team without Sexton despite Carbery’s rapid improvement. I have been talking about Ireland becoming the #1 team in the world since 2014. This is their 6 nations to lose. •	England (Dublin) Perfect start, getting England early and at home. •	Scotland (Edinburgh) Given Scotland’s squad churn and Ireland’s makeup it’s getting Scotland early makes up for being away. •	Italy (Rome) Perfect. Not wasting a home game. •	France (Dublin) France will be on the improve but being in Dublin will tip the balance. Injuries and centralised contracting have been the Achilles Heel for Welsh Rugby since their enormous success of the late 2000’s Their club system is struggling to generate the next batch of talent in the same way that Ireland is. Despite this Gatland has still produced impressive results and they remain a huge dark horse. Their draw is hugely helpful until Dublin in rd 5. •	France (Paris) Perfect for Wales given France’s early jitters. •	Italy (Rome) Perfect place to play them, but no time to experiment. •	England (Cardiff) Exactly where you want to play England. If up against an England that has lost lose the first 2 then expect a very different England. •	Scotland (Murrayfield) Will be evenly poised depending on line-ups. •	Ireland (Cardiff) Almost entirely depends on whether Ireland have suffered injuries through the attacking spine. I think improvement is coming for Italian Rugby but it feels like 2 steps forward and 1 back. Last year’s results showed an improvement through the tournament. They are moving towards a home-grown model and Benetton’s club form has dramatically improved as their stability develops. In a few years this will start to appear at Test level. •	Scotland (Murrayfield) All being equal this is not great for Italy. •	Wales (Rome) Not great either as you want England or France early at home. •	Ireland (Rome) It only gets worse. •	England (London) England will be warming up. •	France (Rome) As per England. Injuries Injuries Injuries for Scotland will hinder this year but they are on the improve. Edinburgh have come good and now challenge for the European cup. Huw Jones went from living a nightmare in 2016 at Twickenham when England put on 61 points and 6 tries almost all through the midfield to winning man of the match a year later in a famous win. Townsend is building something but the breakthrough may not be this year as Scotland do not have the depth to if they need to turnover players. •	Italy (Edinburgh) Banana skin but home should see it through. •	Ireland (Edinburgh) Not ideal. Best hope is having 1st choice team. depend on which team the French put out. •	Wales (Edinburgh) Potentially good setup for a win if maintained stability of team. depend on who still has a chance to win the tournament. Ben Darwin represented the ACT Brumbies in Super Rugby and gained 28 Caps for the Wallabies mostly playing at Tighthead Prop. Following is professional playing career he amassed considerable experience in coaching, player development and analysis. This includes a variety of coaching and performance analysis positions with the Western Force, Melbourne Rebels and in Japan with NTT Shining Arcs and Suntory Sungoliath. Driven by a desire to introduce a greater degree of empirical analysis into professional sport, Ben started GAIN LINE Analytics in 2013. With the ongoing development of Cohesion Analytics Ben now works within professional Rugby League, Rugby Union, European Football and Cricket as well as significant media and speaking commitments.